Oregon makes it convenient for a new business to organize and register with the state. The Corporation Division of the secretary of state's website contains all of the information needed to create a new limited liability company (LLC) under the laws of the state. The state website provides the option of filing articles of organization by mail by downloading a state-approved template or filing over the Internet, by using the electronic filing system. Go to the Corporation Division of the Oregon secretary of state website. The website contains all of the information needed to form a new LLC by filing articles of organization with the state, including step-by-step instructions, a fee schedule, a sample template and an electronic filing system. Check the availability of the business name you want to use for the LLC. State law requires the business names of new LLCs to meet two requirements: the name must be unique and distinguishable from any other business registered in the state, and the name must append the words "limited liability company" or the abbreviation "L.L.C." or "LLC" to the end. Select the "Business Name Search" link in the "Featured Services" section of the state website and conduct a search. Register with the state's "Secure Access System." Select the "Register Online" link in the "Start a Business" section of the website. Follow the "New Users" link and complete the requested information. Once you have a username and password, log in to the electronic filing system. Complete and file articles of organization by using the electronic filing system. 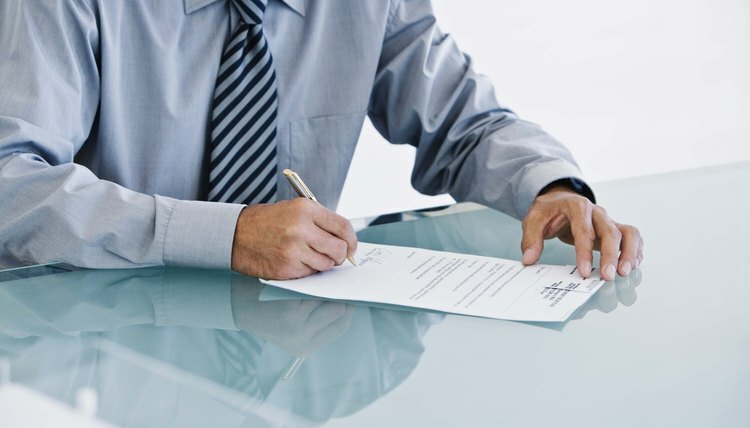 The system will request basic business information, including the name of the LLC; the name and physical address of a registered agent, which is a person or entity assigned to receive official notice if the LLC is served with a lawsuit; and the name, address and signature of the person completing the paperwork. The filing fee is $100 as of 2010 and must be paid by credit card. The filing is not effective upon submission. The state processes the filing over the course of a few business days and sends a confirmation email once the articles have been filed. At that point, you can log back into the system and print a stamped copy of the filing for your records. Download the articles of organization template from the state website if you would rather submit the articles by mail. Select the "Business Forms" link on the sidebar menu and the "Oregon Limited Liability Companies" link from the "Which type of business do you need forms for?" section. Download and fill out the articles of organization template. This document requests the same information as the electronic filing system. Follow the instructions for mailing the articles to the secretary of state's office with the appropriate fee. Terry Masters has been writing for law firms, corporations and nonprofit organizations since 1995, specializing in business topics, personal finance, taxation, nonprofit issues, and general legal and marketing content creation for the Internet. Terry holds a Juris Doctor and a Bachelor of Science in business administration with a minor in finance. Masters, Terry. "How to Create an LLC in Oregon." , https://legalbeagle.com/create-llc-oregon-3440.html. Accessed 19 April 2019.